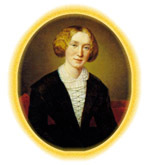 In the epilogue to her life of George Eliot Elsemarie Maletzke pays tribute to the work of Gordon S. Haight and states that biographers who have come after him have found nothing really new to add beyond a more critical assessment of Eliot's person. The statement is true at least of this biography, which makes no claims to new findings and which follows Haight closely, often to the point of citing the same passages from letters or journals, while at the same time adopting an altogether less respectful and more critical attitude towards its subject. Where Haight reports without comment or evaluation, Maletzke is ready to pass judgement: for instance, George Eliot's unwillingness to tear herself away from Lewes and London to visit her sister Chrissey, who was dying from consumption, is brusquely criticized as 'neurotic hesitancy'. Similarly, a letter discouraging the loyal Sara Hennell from staying with the Leweses in Richmond, because they had little room and a visit would disturb their work, is castigated as 'rudeness in the best Evans vein', and followed by the pointed comment that Marian was inclined to assume that other people would quietly accept the kind of behaviour she herself could never tolerate.